A colored object placed within the Life Area (of your space) associated with that color can help energize that space. 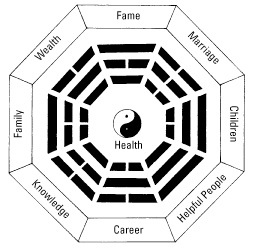 By placing the Feng Shui Octagon, a tool for mapping the energies of a home or lot, over your lot plan or a floor plan of your home (starting with the first floor and then moving to any additional floors), you can figure out which parts of your home fall in which Life Areas and cure them with an appropriately colored object. From painting the walls yellow in the Health Area of your home (for better health and physical well-being) to positioning a healthy green plant in the Family Area of your home or lot (to encourage unity and a stronger family bond), Feng Shui encourages the use of color to enhance your life energy. The following table shows you how to apply color to magnify the energy of each Life Area.